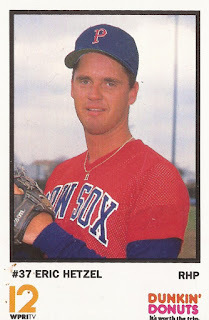 Eric Hetzel made the Boston Red Sox for the first time in June 1989. He told his hometown Alexandria Town Talk the next month his thought process once he arrived. "Going back down to the minors has been in the back of my mind every time I pitch" Hetzel told The Town Talk. "But I need to get that out of my mind. You can't worry about it. I just have to go out there and pitch." Hetzel went out there and pitched for the Red Sox for stretches of the remainder of the season and returned for some time the next year. Those two seasons, amounting to 21 total outings, 19 starts, proved the extent of his big league career. Hetzel's career began in 1985, taken by the Red Sox in the first round of the June secondary draft out of Louisiana State University. Hetzel started with the Red Sox at single-A Greensboro. He went 7-5 over 15 starts. He's not recorded as playing in 1986, but returned to single-A Winter Haven for 1987. He went 10-12 over 2 starts there. Hetzel then made the jump to AAA Pawtucket for 1988 and then returned there to start 1989. He debuted with Boston July 1. He pitched into the sixth inning of his debut without giving up a run. He also picked up the win. "I was a little nervous," Hetzel told reporters afterward. "But I think I was more nervous in spring training. But that was more from sitting around in the pen and just waiting for my chance." Hetzel went on to get into 12 games for the Red Sox that year, starting 11. He went 2-3, with a 6.26 ERA. Hetzel then returned to the Red Sox the next April. In his third outing, he went seven innings and gave up a single run. Afterward, Hetzel felt encouraged. "If I continue to throw the way I am I think I can win a lot of games up here," Hetzel told reporters. He stayed with the Red Sox through the end of May, running into a series of rockier starts. He then saw a relief outing in September. In his nine outings, Hetzel went 1-4, with a 5.91 ERA. Hetzel returned to the minors and AAA Pawtucket in 1991. His main career then ended on arthroscopic surgery. He returned for one more brief final look in 1994 at independent Beaumont to end his career.